Facebook Inc. unveiled a new networking-equipment system designed to displace products from companies like Cisco Systems Inc. and Juniper Networks Inc. with flexible hardware at the heart of large data centers. The system, nicknamed 6-pack, will let Facebook build networks by filling large racks with a smaller switch called Wedge, introduced in June. Using its own design helped Facebook, whose social-networking website has 1.4 billion users, reduce spending on infrastructure and upgrade its capabilities without depending on outside suppliers. The 6-pack is built to replace high-capacity spine switches that handle the bulk of traffic in data centers. Though it was originally marketed as a cheaper, top-of-rack switch, Wedge was designed to become a building block for systems to replace more expensive kinds of gear, said Najam Ahmad, Facebook’s vice president of infrastructure. The spine switch market was worth about $2.9 billion in 2014, smaller yet more profitable than the $3.1 billion top-of-rack switch market, according to Infonetics Research, a unit of IHS Inc. In the past, Menlo Park, California-based Facebook bought its spine switches from traditional networking-gear providers like Cisco and Juniper, Ahmad said, without specifying the company’s suppliers. The 6-pack system will replace these systems while encouraging traditional network-equipment makers to change their designs, he said. “I see this as a challenge, as an opportunity for them, rather than a threat,” Ahmad said. 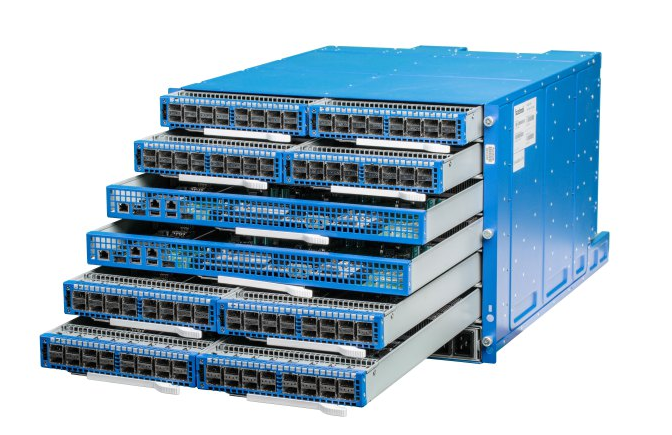 Switches are the biggest business for Cisco, the world’s largest maker of networking gear. In the quarter that ended in January, 30 percent of revenue came from its switch product lines. Since 2011, Facebook has been working with companies to develop new low-cost systems for its data centers, which house tens of thousands of server computers that store and dish out information for its website and other services. Suppliers such as Synnex Corp. and Quanta Computer Inc. have benefited from this strategy, while incumbents like Dell Inc. and Hewlett-Packard Co. have faced more competition. Facebook shares its insights and technologies through a group called the Open Compute Project, which encourages multiple companies to work together to design lower-cost systems. Other Open Compute members include Microsoft Corp. and International Business Machines Corp.